Acute kidney injury (AKI) is one of the popular topics of discussions due to increasing development of biomarkers recently. The disease progression and prognosis may be determined by these biomarkers detected in blood and urine specimens. Since acute kidney injury is associated with a broad spectrum of disease conditions, prevention and early detection of AKI becomes very important in those clinical settings. Early measurements of AKI biomarkers predict subsequent development of intrinsic AKI, dialysis requirement, duration of intensive care unit stay and finally affect mortality. We, here, discuss the acute kidney injury in different clinical situations and associated natures of biomarkers, which may help us guide to prevent and treat AKI more effectively. Acute kidney injury (AKI) is one of the major causes of morbidity and mortality encounter in hospitalized patients, especially intensive care centers. Early detection may improve the hospital stay, patients’ prognosis and reduce expensive medical costs. Nowadays, different types of bio-markers for acute kidney injury are emerging to play a role in accurate diagnosis, early detection, monitoring therapy and predicting the prognosis. This review discusses the clinical use of biomarkers in acute kidney injury. Acute kidney injury (AKI), a preferred nomenclature to previously termed acute renal failure, refers to a spectrum of disease ranging from a minimal elevation in serum creatinine to anuric renal failure, clinically manifested by changes in blood chemistry and fluid disturbances. In 2002, the Acute Dialysis Quality Initiative (ADQI) group proposed a definition for AKI stems from criteria for three grades of increasing severity (Risk of acute renal failure, Injury to the kidney, Failure of kidney function) and two outcome classes (Loss of kidney function and End-stage kidney disease) (RIFLE classification) [1,2]. Chertow and colleagues noticed that a rise in serum creatinine of just ≥0.3 mg/dl had a four-fold higher multivariable-adjusted risk of death . The Acute Kidney Injury Network (AKIN) group modified the AKI definition based on RIFLE criteria in 2005 . 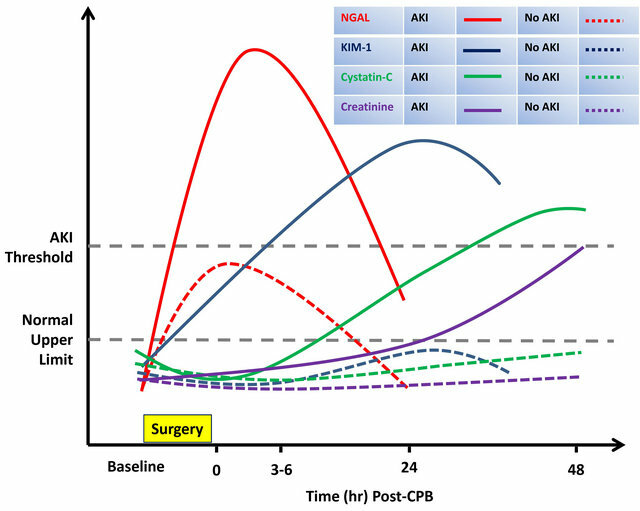 This new staging system classified the patients with a change in serum creatinine (SCr) concentration ≥ 0.3 mg/dl (≥26.4 μmol/l) within 48 hours as AKIN stage 1, whereas patients receiving renal replacement therapy are included in AKIN Stage 3. RIFLE-Risk classified as Stage 1, RIFLE-Injury and Failure as Stages 2 and 3, respectively; and the two outcome classes RIFLE-Loss and RIFLE-End stage kidney disease has been removed  (Table 1). Table 1. Diagnostic criteria for acute kidney injury depend on acute kidney injury (AKIN) network. Scr: serum creatinine; UO: urine output . found to be present in about 1% of hospital admissions . The causes of community-acquired AKI also may include pre-renal azotemia, intrinsic renal failure, and post-renal obstruction. The risk factors for developing community-acquired AKI include, old age > 75 yrs, patients with underlying chronic kidney disease (CKD, eGFR < 60 mls/min/1.73m2), cardiac failure, atherosclerotic peripheral vascular disease, liver disease, diabetes mellitus and patients taking nephrotoxic medications, alternative medical therapies, etc. Other disorders include exercise or heat-stroke related rhabdomyolysis, crushsyndrome from natural disasters such as earthquakes, may also contribute to community-acquired AKI . AKI is present in about 7% of all hospitalized patients , and more than 30% of critically ill patients experienced AKI [7,8]. The incidence of AKI greatly increased in the hospital settings with improved critical care, increase diagnostic and procedural techniques, and improved management of other organ failures. The risk factors for hospital acquired AKI are sepsis, elder age, pre-existing kidney dysfunction. Since the widespread use of primary percutaneous coronary intervention protocols and intravenous contrast related investigations in intensive care unit, contrast related renal injuries are becomingly known as important risk factor for AKI. Other causes of AKI intensive care units may also include pre-renal azotemia, ischemia, organ failures, toxins, obstruction, etc. The severe AKI in ICU is now considered as a part of a multiple system organ failure (MSOF) complex and its mortality varies over 50-80% in ICU [9, 10]. The natural course of AKI has not been benign as previously thought, and >20% of ICU dialysis survivors progress to CKD and ESRD within 3 - 5 years. In a cohort study, the RIFLE criteria—risk, injury, and failure— found to be associated with inpatient mortality rates of 8.8%, 11.4%, and 26.3%, respectively . Pathophysiology of AKI The mechanism of acute kidney injury depends on the severity of insults which vary from increased risk, progressive damage to decreased glomerular filtration rate (GFR), kidney failure and death. Abolishment of renal auto-regulation occurs in ischemic renal injury due to imbalance between vasoconstrictors and vasodilators. Diminished renal perfusion may cause elevated of endothelial injury markers, inflammatory mediators like TNFa, IL-18, etc. with reduced nitric oxide derivatives with resultant endothelial injury. High levels of vasoconstrictors with persistent hypoxia may lead to cellular damage and cell death with reduction in GFR. Necrosis and desquamation of tubular cells result in tubular obstruction, which may further reduce GFR. Local inflammatory mediators may lead to interstitial inflammation, small vessel obstruction and finally, local ischemia [12,13]. Direct nephrotoxic effects may result in decreased GFR in cases of toxic AKI. A better understanding of the clinical continuum of AKI is needed for better diagnostic and therapeutic measures. The systemic inflammatory response syndrome , insulin resistance with hyperglycemia associated injuries , and associated oxidative stress may take part in the development of ischemic and toxic AKI in critically ill patients. Since kidney injury itself may also generate oxidative stress, increased oxidative stress biomarkers are found to be elevated [16,17]. Biomarkers of structural injury elevated earlier than those for functional injury during the AKI event. Overall, biomarkers, especially urinary biomarkers of AKI will facilitate earlier diagnosis, provide specific preventative and therapeutic strategies and with the overall improve in outcomes. • Decreases proportionally with the renal recovery status. Urinary biomarkers are regarded more non-invasive, easy to measure, easily obtainable, and clinically earlier detection than blood biomarkers [18,19]. Injury to different segment regions of nephrons may excrete different specific urinary biomarkers. Detection of high-molecular weight protein, like albumin, immunoglobulin, and transferrin in the urine may be associated with glomerular injury. Low-molecular weight proteinuria (e.g. 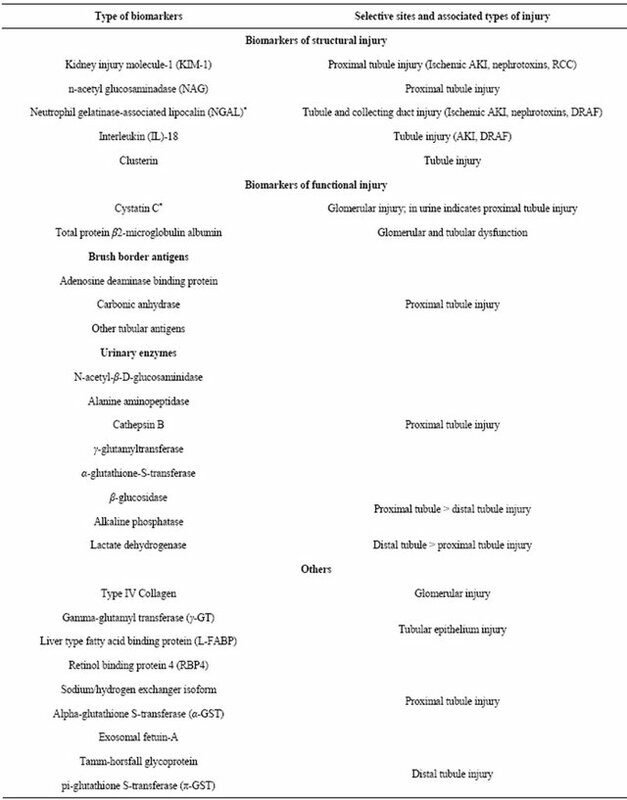 α-1 microglobulin, β-1 microglobulin and retinol binding proteins) [20,21], brush border antigens [20,22,23], urinary enzymes [20,24] and other urinary proteins [25-28] are associated with damage to renal tubules. However, sufficient validation is needed to use these markers for the screening and differentiating the site of injury clinically. Depend on the time of appearance after AKI, the urinary biomarkers may be classified into biomarkers of structural injury, and those of functional injury. Structural injury biomarkers are those appearing in the urine immediately after tubular cell apoptosis, and include KIM-1, NGAL, NAG, IL-18, and clusterin. Functional injury biomarkers are delayed markers for injury which may indicate global renal dysfunction, and constitutes cystatin C, total protein, albumin and β-2 microglobulin (Table 2). Recently, more than 20 protein biomarkers have been intensively reviewed in human and animal models of AKI to identify which ones may signal AKI prior to a rise in serum creatinine. Since the gold standard kidney biopsies are not clinically practicable in AKI patients as outcome measures, rise in serum creatinine is still used as clinical outcome. A potential biomarker should increase rapidly in the settings where the timing of renal injury is known (e.g. after cardiopulmonary bypass (CPB) or immediate post-transplant period). The validity of biomarker is assessed most commonly by receiver operating characteristic (ROC) curve, which plots 1 minus specificity of the biomarker on the x-axis against the sensitivity of the biomarker on the y-axis. The area under curve (AUC) is generated from these plots, and an AUC of 1 represents a perfect biomarker and AUC of 0.5 reflects complete lack of accuracy. Neutrophil gelatinase-associated lipocalin (NGAL) is the one of the most consistant biomarker found during AKI. It is a 25-kDa polypeptide covalently bound to gelatinase from human neutrophils, and predominantly found in proliferating nuclear antigen-positive proximal tubule cells. It is markedly up-regulated in early post-ischemic mouse and rat kidneys . The urinary NGAL protein has been demonstrated to predict the occurrence of ischemic AKI in pediatric and adult patients after cardiac surgery [30,31]. In a prospective study done on pediatric patients undergone cardiopulmonary bypass (CPB) by Mishra et al. , the urinary NGAL was increased 100 fold and detected within 2 hours of CPB, which precede 50% increase in SCr by 1 - 3 days. In contrast, urinary NGAL did not rise in those patients who did not develop AKI. The area under the receiver operating characteristic curve (AUC-ROC) was 0.99 at 2 hours and 1.00 at 4 hours after CPB . Plasma NGAL was also found to predict morbidity and mortality in pediatric patients who undergo cardiac surgery . Urinary NGAL also was found to be elevated within 1 hour after cardiac surgery in adult patients and revealed the AUC-ROC of 0.74 at 3 hours and 0.8 at 18 hours . In a small prospective study of pediatric and adult kidney transplant patients, urinary NGAL is demonstrated as an excellent predictive marker (AUC-ROC 0.9 at day 0 after transplantation) for the development of delayed graft dysfunction and renal replacement therapy . Furthermore, a recent study demonstrated that a single urine NGAL measurement in the emergency department could better predict the need for Nephrology consultations, intensive care unit admission, dialysis initiation, or mortality, etc. than could an elevated serum creatinine . KIM-1 is an orphan trans-membrane receptor of unknown function. It is undetectable in normal kidney tissue or urine, and is markedly increased in ischemic and nephrotoxic proximal tubule epithelial cell injury, and in renal cell carcinoma [35-37]. In a small cross-sectional study, Han et al. demonstrated the elevation of urinary KIM-1 levels within 12 hours after an initial ischemic insult and much earlier than granular casts appearance in established AKI. Higher urinary KIM-1 was also associated with adverse outcomes in these established AKI patients. Urinary KIM-1 was elevated and found to have an AUC-ROC of 0.57 at 2 hours, 0.83 at 12 hours, and 0.78 at 24 hours after pediatric cardiac surgery in a case-control study  using the same cohort in the NGAL study previously described . High urinary KIM-1 may also predict the graft loss in renal transplant patients independent of other common risk factors like creatinine clearance, proteinuria, and donor age . Urinary KIM-1 was also proved in some studies to distinguish AKI from CKD and normal [41,42]. Table 2. Biomarkers of acute kidney injury. *Available in both serum and urine; DRAF: delayed renal allograft function; RCC: renal cell carcinoma; AKI: Acute kidney injury; IL: interleukin; TNF: tumor necrosis factor. Interleukin (IL)-18 is a pro-inflammatory cytokine which involve in mediating inflammation process during ischemic, sepsis and nephrotoxic AKI . Since IL-18 serves to recruit the neutrophils during ischemic injury, elevated urine IL-18 have been demonstrated in patients with ischemic acute tubular necrosis (ATN) . In a crosssectional study, Parikh et al. demonstrated that markedly elevated day 0 post-transplantation urinary IL-18 concentration was found in patients with delayed allograft dysfunction (AUC 0.95) . In a prospective study of 138 patients with acute respiratory distress syndrome, elevation of urinary IL-18 could predict AKI one day ahead of serum creatinine with an AUC-ROC 0.73, and also independently predicts mortality in this cohort group . Urinary IL-18 was also found in elevated after CPB, and has an AUC-ROC of 0.61 at 4 hours, 0.75 at 12 hours, and 0.73 at 24 hours following CPB to predict AKI . In the critically ill patients, the urinary IL-18 level was also regarded as an independent predictor of mortality. Cystatin C is a 13kD cysteine protease inhibitor protein that is produced by all nucleated cells into plasma, and freely filtered from glomerulus, completely reabsorbed and not secreted in the tubules. It is less influenced by factors other than glomerular filtration rate (e.g. age, gender, race, or muscle mass) . Several studies have demonstrated that a change in serum and urine Cystatin C is more sensitive than a change in Serum creatinine in predicting a change in glomerular filtration [46-48]. In a prospective study of 85 critically ill patients at high risk to develop AKI, a 50% increase in serum cystatin C was noted one to two days before serum creatinine with an AUC of 0.97 and 0.82 respectively . Furthermore, serum cystatin C also predicts the risk of AKI-associated cardiovascular morbidity and mortality in critically ill patients . In older patients, increased serum cystatin C is also found to be a stronger predictor for the risk of death and cardiovascular events [50,51]. Furthermore, serum cystatin C levels > 1.0 mg/L may also predict cardiovascular events and mortality in participants with serum creatinine-based eGFR > 60 ml/min per 1.73 m2 [52,53]. Urine cystatin C has also been studied and some studies found that urine Cystatin C performed better for AKI prediction than did serum Cystatin C [54,55]. In addition, increased urinary cystatin C and α1-microglobulin may be early predictors of an unfavorable clinical outcome in ATN, reflected by the requirement for RRT. Severity prediction with these markers could assist in improving the outcome of ATN . Cystatin C also is extensively studied in chronic kidney disease patients. Since serum cystatin C has higher sensitivity and higher negative predictive value in determination of reduced GFR than serum creatinine, many studies examine the serum cystatin C to use clinically in GFR determination . A recent cross-sectional study found that the combined creatinine-cystatin C equation to estimate GFR better than either of these markers alone in chronic kidney disease patients . Although these findings are encouraging, additional studies are further needed for clinical use of serum and urine cystatin-C in acute and chronic renal disease conditions. The ultimate diagnostic goal in AKI is to distinguish pre-renal azotemia, renal AKI (ATN), obstruction, Urinary traction infections, and underlying CKD, etc. Studies are underway to distinguish the various types of AKI by using biomarkers. For example, urinary KIM-1 could distinguish ischemic ATN from pre-renal azotemia and CKD in one study , and KIM-1 also found to distinguish AKI from CKD and normal with an AUC of 0.94 . Biomarker combination may be required in improving determination and differentiating the AKI. The sequential appearance of AKI biomarkers has been noted during serial measurements of multiple urinary biomarkers after pediatric cardiac surgery, with urine NGAL peaks at 2 hrs followed by the IL-18 peak at 12 hrs. Urinary IL-18 has a lower AUC (0.74 at 12 hrs) than NGAL (0.99 at 2 hrs) [31,58]. This sequential increase resembles troponin I, CPK and LDH of acute myocardial injury, which may help us to determine the time since injury in AKI. Although NGAL alone can predict AKI in the early hours, the combination of both urinary markers may predict the borderline cases in later periods after surgery. Several biomarker combinations may also predict AKI after adult cardiac surgery (Figure 1) . These biomarker combinations have been tested in only small studies and limited clinical situations. Multicenter studies are needed to determine which biomarker combination best predict and determine outcome in AKI. Figure 1. The comparism for the predicted time course of change in urine or serum biomarker levels in AKI and non-AKI patients after cardiac surgery. Patterns of change represent ideal circumstances, which have not been consistently demonstrated in clinical studies. AKI: acute kidney injury; CPB: cardiopulmonary bypass; creatinine: serum creatinine; cystatin-C: serum cystatin-C; KIM-1: urinary kidney injury molecule-1; NGAL: urinary neutrophil gelatinase-associated lipocalin. Modified from . the decision making in initiation of RRT remains subjective in most clinical settings. 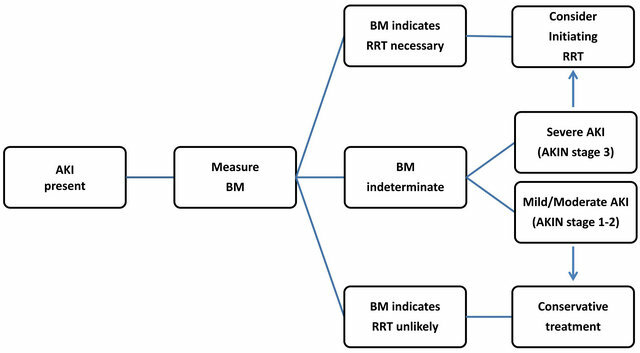 An opinion-based clinical algorithm was drawn using RIFLE/AKIN criteria, and several patient-specific factors to decide when to start RRT in critically ill adults . Recently, the well accepted metabolic derangements need for RRT include plasma BUN > 100 mg/dl, hyperkalemia > 6 mEq/L with EKG abnormalities, hypermagnesemia > 8 mEq/L, severe metabolic acidosis pH < 7.15, diuretic resistant fluid overload [61-65]. Some studies demonstrate better renal outcome in patients who start RRT while in RIFLE-Risk or Injury than those who started RRT in RIFLE-Failure status [66,67]. Clinically, it is possible for some RIFLE-Risk and Injury cases to recover spontaneously before complications develop and in these cases RRT may not benefit. And on the other hand, if we could easily categorize these patients in RISK-Risk and Injury cases with severe and sustained renal injury, we can start RRT to provide renal support and to prevent AKI-related complications. Some studies suggest novel biomarkers like NGAL, Cystatin-C, NAG, KIM-1, and α1-microglobulin can distinguish patients in whom RRT will be needed [55, 68]. A potential use of biomarkers integrated into the clinical decision algorithms to initiate RRT is recently proposed by Cruz et al. (Figure 2) . In this algorithm, two cut-offs are needed, one represents a high likelihood of needing RRT, and another indicates RRT is very improbable. The first cut-off would identify those AKI patients in whom spontaneous renal recovery is not likely. The second cut-off distinguishes those AKI patients with probable spontaneous renal recovery. These cut-off values may be absolute value or relative change from baseline value, and vary with different clinical settings. Biomarkers are repeatedly measured during conservative therapy to monitor and reassess the disease progress. However, more studies are needed to use these biomarkers effectively in clinical AKI patients. Figure 2. Biomarker-based strategy for renal replacement therapy in AKI patients. AKI: acute kidney injury; BM: biomarker; RRT: renal replacement therapy; AKIN: Acute Kidney Injury Network. Modified from . of AKI. Additionally, no cutoff value that is predictive of AKI has been available nowadays. The role of these biomarkers in association with other comorbidities including sepsis, etc. is not accomplished. Bomarkers of AKI such as NGAL, KIM-1, IL-18 and Cystatin C are now becoming greatest interest among different AKI clinical settings. Early measurements of AKI biomarkers predict subsequent development of intrinsic AKI, dialysis requirement, ICU stay, days of hospital stay and finally affects mortality. Future studies should evaluate biomarker outcomes independent of serum creatinine, and should consider biomarkers as entry criteria for AKI therapeutic protocols. Such an advance would finally find out the gold standard biomarker for AKI, as in case of troponin I for potential myocardial ischemia. J. Kaufman, M. Dhakal, B. Patel and R. Hamburger, “Community-Acquired Acute Renal Failure,” American Journal of Kidney Diseases, Vol. 17, No. 2, 1991, pp. 191-198. R. W. Schrier, W. Wang, B. Poole and A. Mitra, “Acute Renal Failure: Definitions, Diagnosis, Pathogenesis, and Therapy,” The Journal of Clinical Investigation, Vol. 114, No. 1, 2004, pp. 5-14. P. Devarajan, “Emerging Urinary Biomarkers in the Diagnosis of Acute Kidney Injury,” Expert Opinion on Medical Diagnostics, Vol. 2, No. 4, 2008, pp. 387-398. N. E. Tolkoff-Rubin, R. H. Rubin and J. V. Bonventre, “Noninvasive Renal Diagnostic Studies,” Clinics in Laboratory Medicine, Vol. 8, No. 3, 1988, pp. 507-526. T. L. Nickolas, M. J. O’Rourke, J. Yang, et al., “Sensitivity and Specificity of a Single Emergency Department Measurement of Urinary Neutrophil Gelatinase-Associated Lipocalin for Diagnosing Acute Kidney Injury,” Annals of Internal Medicine, Vol. 148, No. 11, 2008, pp. 810-819. W. K. Han, A. Alinani, C. L. Wu, et al., “Human Kidney Injury Molecule-1 Is a Tissue and Urinary Tumor Marker of Renal Cell Carcinoma,” Journal of the American Society of Nephrology, Vol. 16, No. 4, 2005, pp. 1126-1134. M. J. Sarnak, R. Katz, C. O. Stehman-Breen, et al., “Cystatin C Concentration as a Risk Factor for Heart Failure in Older Adults,” Annals of Internal Medicine, Vol. 142, No. 7, 2005, pp. 497-505. M. G. Shlipak, R. Katz, M. J. Sarnak, et al., “Cystatin C and Prognosis for Cardiovascular and Kidney Outcomes in Elderly Persons without Chronic Kidney Disease,” Annals of Internal Medicine, Vol. 145, No. 4, 2006, pp. 237-246. N. Lameire, “Pathophysiology of Acute Renal Failure in Sepsis,” Acta Clinica Belgica, Vol. 59, No. 4, 2004, pp. 199-208. N. Lameire, W. Van Biesen and R. Vanholder, “Acute Renal Failure,” Lancet, Vol. 380, No. 9857, 2012, p. 1904. *These authors equally contributed to this work.